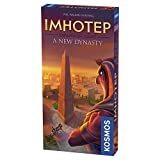 Over six rounds, they move wooden stones by boat to create five seminal monuments, and on a turn, a player chooses one of four actions: Procure new stones, load stones on a boat, bring a boat to a monument, or play an action card. While this sounds easy, naturally the other players constantly thwart your building plans by carrying out plans of their own. Only those with the best timing - and the stones to back up their plans - will prove to be Egypt's best builder. 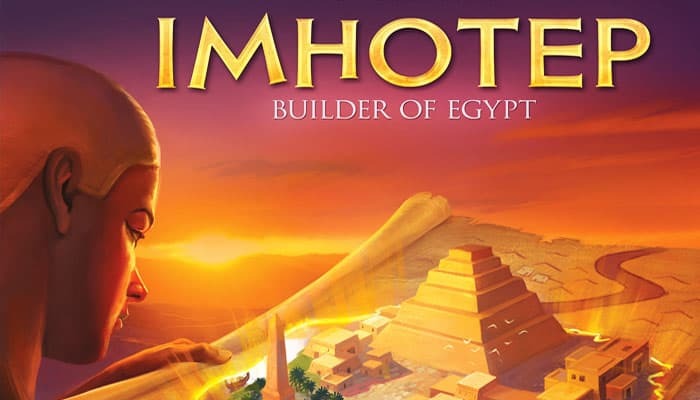 Imhotep was the first and most famous master builder of ancient Egypt. He is considered one of the earliest polymaths in the history of humanity. 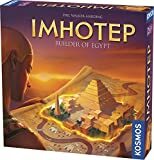 For example, he is said to have been responsible for building the very first pyramid in Egypt - the Pyramid of Djoser in Saqqara. Can you match his accomplishments in creating monuments for the ages? For each stone delivered here, the owner of the stone can immediately take any 1 face-up market card. Important: The delivered stones must be returned to the quarry after taking the card. Drawn cards must be placed face up in front of you. The red cards must be played immediately. These are then placed in the discard pile. All site boards have an A side and a B side. You should always start playing with just the A sides. Later on, you can try the B sides. You can also play with a mix of A and B sides. Why not try various combinations? In this section, you will find an overview of all of the market cards and a more detailed description of the way they work. Wait to read these explanations until a given market card comes into play.